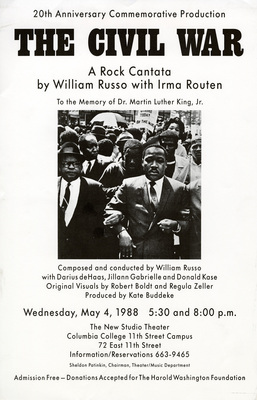 A rock cantata by William Russo with Irma Routen. Composed and conducted by William Russo with Darius deHaas, Jillann Gabrielle, and Donad Kase. Visuals by Robert Boldt and Regula Zeller. Produced by Kate Buddeke. New Studio Theater. Theater, Theatre, Dr. Martin Luther King.